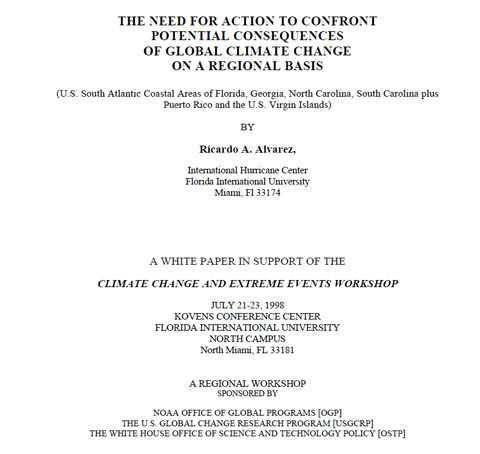 In 1998 Ricardo A. Alvarez wrote a white paper for the Climate Change and Extreme Events Workshop, hosted by Florida International University, at the Kovens Conference Center on 21-23 July 1998, North Miami, Florida. I was managing director for that worlshop. The workshop was sponsored by NOAA Office of Global Programs (OGP), The U.S. Global Change Research Program (USGCRP) and the White House Office of Science and Technology Policy (OSTP). This workshop was one of several regional workshows that were part of the so-called National Assessment on Climate Change mandate by the U.S. Congress, and it focused on the region identified as U.S. South Atlantic and Caribbean, which included Florida, Georgia, North Carolina, South Carolina, Puerto Rico and the U.S. Virgin Islands. This white paper provided a basis for discussion during plenary sessions and the various concurrent sessions during the 3 days of the conference. It is important to notice that this paper was written in 1998 at a time when our collective knowledge on the topic of climate change was much more limited that it is today, yet it raises key questions that have proven over time to be critical to the issues of mitigation and adaptation; also some of the questions and uncertainties expressed in this document remain unanswered or continue to be hotly debated today. As the author of this paper I have to say that when I wrote it I had only been involved in the field of global climate change for a few months (since late 1997), but researching and writing this paper and acting as managing director for the workshop first made me realize how critically important this issue is for all of humankind, but this also motivated me to explore what we could do in terms of adaptation especially relative to human activity and the built environment. This paper and that 1998 workshop provided a foundation for my work, which continues today twelve years later, on the specific field of adaptation of the built-environment to climate change.